There are many options available to users when it comes to make payment for buying railway tickets online. Paytm is brand new option which has become already popular among the customers of railway. Paytm is actually an online wallet where you can store money and use it to make quick recharges, pay bills, do shopping, send money to friends & pay for various services like Uber, MakeMyTrip, BookMyShow & others. Best part is that it is completely secure digital payment option. Please note that - as of now IRCTC disables all cash card/e-wallet options including IRCTC prepaid cards from 8 am to 12 noon. So you can book your tickets on the site with your Paytm Wallet after 12 pm. Most of you who regularly use IRCTC online ticketing system for railway and flight booking would be aware of the fact that IRCTC has its own eWallet. We have already explained how to use IRCTC eWallet for faster tatkal booking. Then what is the reason for IRCTC to go for another eWallet, a third party digital wallet - paytm? The answer lies in the goodwill and reputation that Paytm has been able to establish among its vast base of customers. It is a well known paying option among people doing mobile recharge, paying bills, booking bus tickets, and even booking movie shows. When you use Paytm you get many bonuses. These include discounts, offers, coupons and deals, that you get every time you pay. It's a big attraction for customers. The Paytm works both on mobile and desktop systems and interface is simple to use. If you have any doubt's about the popularity of Paytm you'll be surprised to know that with eight lakh orders every day, Paytm has surpassed the volume of transactions that happen on Indian Railway Catering and Tourism Corporation (IRCTC). According to Vijay Shekhar Sharma, Paytm’s value is safely 30-40% more than that of IRCTC in the country. "The best part is that two of our three orders happen on mobile and incrementally 80% new users are coming from mobile internet," says Vijay. Usability added with superb customer care and very simple mobile payment options makes it a great value for users. Paytm provide 100% assurance. If you have any issue, your money is immediately refunded. You can trust them with eyes closed. Your money yours! All refund come with no questions asked guarantee. Company even promises to the users "Happiness is guaranteed at Paytm. If we fall short of your expectations, give us a shout." Perhaps this is the reason as to why it is the only commerce company (for Physical Goods) to have RBI licensed semi-closed prepaid mobile wallet. Paytm has great plans looking ahead, Company aims to extend its user base to 50 million wallet users and 1 million SME merchants by the end of year 2015. Looking at their 100% growth in wallet users over the last 6-12 months there is little doubt that target is easily achievable. All in all, Paytm is a great option for making all sorts of payments, including the payment for railway ticket booking. 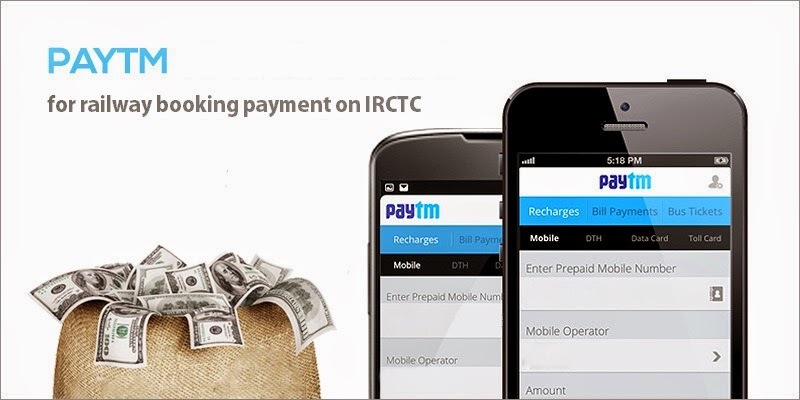 So get registered on Paytm and next time you login to IRCTC, pay using it. Don't forget to make merry with discount coupons.